The new poker tournament that the TV station Canal+ organizes from this year on, called Stars of Poker, will start its first step during this month of July. Having six steps, this live tournament produced by CANAL PLUS Events & KAWA Production is expected to gather great professional players but also six live poker or online poker enthusiasts qualified through Internet satellites. A unique concept of organisation was broadcasted to this television appointment. Moreover, the TV station has chosen great stars to present this emission such as the sports journalist David Berger and the Franco- American player poker Vanessa Rousso. After the Step in Nîmes which will take place on next the 17th July, five other steps of which passages in Saint Nom La Bretèche on the occasion of the Vivendi Trophy on September, Tignes or Olympia, during which every player has got one chance against 18 to win 100,000 at every step, will be held. 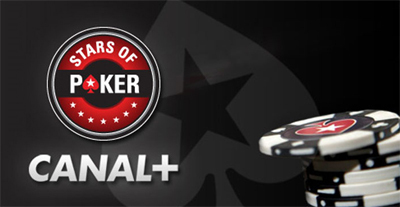 The great finale of this program Stars of Poker will take place then in Cannes with a gain of 300,000. For the step in Nîmes, the professional players who will participate in are already known like Bruno King Fitoussi, Luca Pagano, Dario Minieri, Katja Thater, Chad Brown and Marcel Luske. Moreover, the sports world will be represented by David Ginola, Jean-Pierre Papin, Willy Sagnol, Tatiana Golovin and Gaël Monfils.